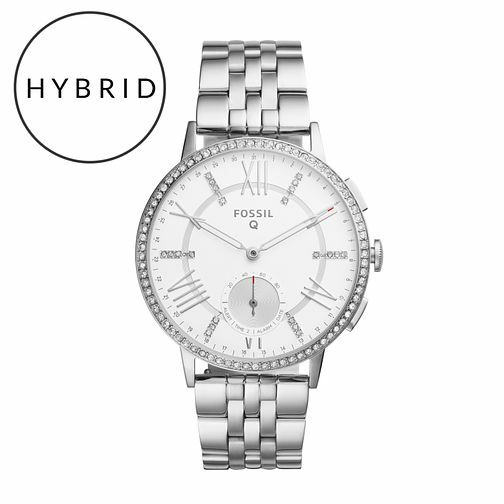 Fossil Smartwatches Gazer Stainless Steel Hybrid Watch is rated 3.0 out of 5 by 1. Rated 3 out of 5 by Anonymous from Nice looking watch but too heavy After months of checking if I should get a smartwatch or a hybrid, I decided to go with this one, first of all there are not so many smartwaches for women, it was either between the Samsung gear s2 (which you can only get it second hand or very expensive at argos) or the fossil ones, second of all I wanted a watch that could tell me how I sleep well none smartwatch would be able to do that because you need to charge them overnight, so I went with this hybrid, it was very nice and shinny, I bought 2 extra bands because it was too heavy with the metal one but in the end I returned it because I have a small wrist and this one was too heavy for me. It was a shame but I couldn't get used to it.